The present and past compositions of communities of single-celled algae in several Canadian lakes and their relationship to the known climate record suggest that these organisms and the lakes they reside in are highly influenced by sun spot cycles. This indicates that fossil diatoms in lake sediments provide a proxy for paleoclimatic and paleoenvironmental change. Hausmann studies diatoms, unicelled algae with shells of silica, which live and die in the sediments. Up to 400 species of these microscopic creatures can exist in one lake. Diatoms make excellent bioindicators, because the diatom community composition changes with environmental changes in acidity, climate, nutrient availability and lake circulation. By examining relationships between modern diatom communities and their environment, Hausmann and her colleagues can reconstruct various historic environmental changes quantitatively. She and her colleagues used sediment traps to study the seasonal fluctuations that occur in diatom communities in four lakes along a climate gradient in the Laurentian Mountains of eastern Canada. They found that the composition of diatom communities changed seasonally and is dependent upon the duration of ice cover and lake water circulation. Hausmann then examined the fossil diatom record from sediment cores taken at lac du Sommet and reconstructed lake water circulation patterns. In collaboration with Guillaume St. Onge of the Institut des Sciences de la Mer de Rimouski, she found that the lake circulation patterns inferred by the fossil diatoms showed that the lake responded to past solar activity. 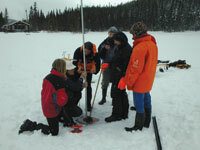 The lake sediment findings corresponded with what is known about historic sun spot cycles, making Hausmann’s findings an important addition to understanding past climatic and environmental changes. PreviousWhy Do Plants Have Thorns? The University of Arkansas Campus Experts website is a searchable database of experts who can talk to the media on current events. Visit The Office of Research and Innovation for more information on research policies, support and analytics. Research Frontiers is home to research news at the University of Arkansas. In addition to daily updates on this website, Research Frontiers magazine is produced by the Office of University Relations in the Division of University Advancement. The mission of the Office of Research and Innovation is to support faculty conducting externally funded research; to involve students in the research enterprise; and to spur economic development in the State of Arkansas through the commercialization of university research.